The relationship of trust between makers of clocks and watches and their customers influenced the development of clock and watch dials. 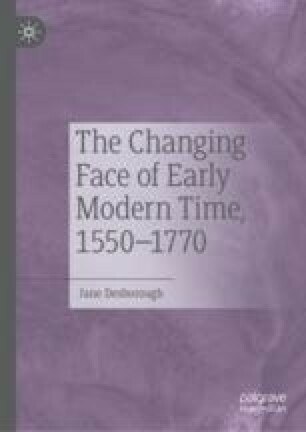 Four key moments within the history of horology in the period 1550–1770 demonstrate that changing relationship: the different hour schemes used in Europe from the mid-sixteenth to the early-seventeenth century; the coexistence of both quarters and minutes in the mid-late seventeenth century; the changing relationship between the sundial and the clock dial in the late-seventeenth and early-eighteenth century; the imitation of precision timepieces in the mid-late eighteenth century. These four moments reveal the various ways in which the changing relationship influenced the format of clock and watch dials in the period and played its role in the arrival of the standard format in 1770.